KIEV, Ukraine -- Doubts grew Wednesday about Ukraine's shaky cease-fire with pro-Russia separatists as both sides accused the other of violating it and the government blamed Moscow for not reining the rebels in. 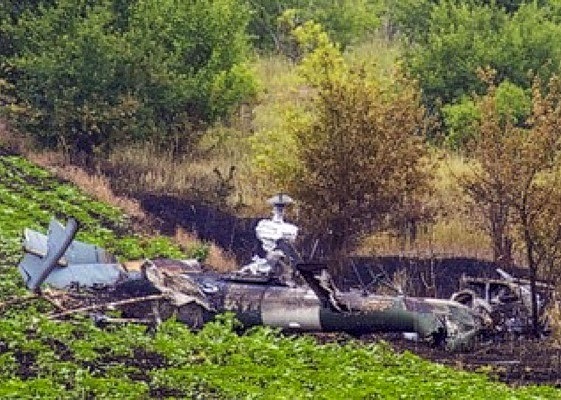 A Ukrainian helicopter was shot down by separatists of the self-proclaimed 'Donetsk People's Republic' on June 24 near the small town of Krasnoarmeysk, outside of Slavyansk, Ukraine. Rebel leaders had agreed to the truce on Monday, but the agreement seen as the first step toward peace talks appeared to be unraveling as clashes continued. The government in Kiev said it had lost 11 troops in combat, including nine who died when rebel fighters shot down a government helicopter on Tuesday. "Once again we see that the pro-Russian terrorists aren't interested in peace. They are here for war and will stop at nothing to destroy the peace and security of Ukraine," the Ukrainian foreign ministry said. Separatist leaders didn't immediately respond, but on Tuesday they claimed the military had attacked separatist positions. Officials in regions bordering the fighting said they expected an escalation now. President Petro Poroshenko "wanted to show he was ready for a peaceful alternative," said Lyubov Shamrai, head of the Izyum region. "But the fighting never stopped and now he will have to resort to the worse option." Ukraine's Foreign Minister Pavlo Klimkin said after meeting with his counterparts Wednesday at the North Atlantic Treaty Organization in Brussels that the government remained committed to the cease-fire. But he also called the downing of the helicopter an "extremely dangerous" provocation that jeopardized peace efforts. Ukraine and the West have accused Russia of controlling the separatists and supplying them with weapons and fighters—a charge Moscow denies. The Ukrainian foreign ministry also accused Russia of not using its influence to stop the rebels. "Despite Russia's declarative statements, the terrorists feel encouraged and a sense of impunity. Moscow has never condemned the terrorist attacks or expressed regret over the numerous deaths caused by their hands," the ministry said. As expected, Russia's upper house of parliament on Wednesday voted to approve a request from President Vladimir Putin to rescind his authority to intervene militarily in Ukraine. But Viktor Ozerov, head of the Russian Federation Council's defense and security committee, said it would closely monitor the situation and quickly reinstate the authority if necessary. Mr. Putin's decision to relinquish his legal ability to send in troops is likely to forestall an effort to impose further sanctions on Russia at a meeting of European Union leaders later this week, when Ukraine is set to sign an agreement on closer economic ties with the bloc. But Western leaders kept up their warnings, with U.S. Secretary of State John Kerry calling for more steps from Russia to de-escalate the crisis and German Chancellor Angela Merkel saying tougher sanctions could still be imposed. "Diplomatic solutions are preferable to all others….But if nothing else helps, sanctions can be put back on the agenda, and this time those of stage three," Ms. Merkel said, referring to broader measures that would target entire sectors of the Russian economy as opposed to individuals and companies. NATO Secretary-General Anders Fogh Rasmussen said Russia's actions in Ukraine posed "a threat to the international order," which could have lasting impact on relations. The alliance's foreign ministers promised new funding to help Ukraine's armed forces in areas such as logistics, command and control and cyberdefense. Ukraine and Russia have also been embroiled in an energy dispute. Russia's state-owned natural-gas company OAO Gazprom cut off supplies to Ukraine nine days ago, after they failed to agree on a new price and Kiev refused to pay part of its debts. Gazprom claims that Kiev owes it in excess of $4 billion. The EU's energy chief, Günther Oettinger, said Wednesday he would resume efforts to bring the two sides together for new talks, which he hoped would take place by mid-July. But during a visit to Brussels, Ukraine's Energy Minister Yuri Prodan signaled that Kiev wouldn't settle its debts until they had agreed on a new price. Ukraine has accused Russia of jacking up the price in April to add to pressure on the country's crippled economy, while Moscow says Kiev is demanding unreasonable discounts. Meanwhile, Ukraine's border service said late Tuesday it had once again abandoned a border post in the Luhansk region after heavy clashes with rebel fighters. On Wednesday, the border service said it had set up a station several miles from the abandoned post and had detected Russian troop and equipment movements on its side of the border. It also accused Russia of allowing "unknown fighters" to pass through the now unguarded crossing. Also, officials in the Kharkiv region—which has been largely unaffected by the insurgency in the regions of Luhansk and Donetsk to its east—said they would erect checkpoints along roads leading from Luhansk to stop "people who may destabilize and complicate the situation in the region" from entering. "The peace initiative launched by the president isn't being accepted by the separatists," the region's deputy governor, Vasiliy Khoma, said. "We must be prepared for the fact that the separatists won't lay down their arms and will continue to fight." A Ukraine defense ministry spokesman said that as of late Tuesday there had been 44 incidents in which rebels fired on government troops since they ceased their offensive. Rebel leaders have blamed the government for instigating the clashes. Mr. Poroshenko has said Ukrainian forces are under orders to return fire if attacked. The cease-fire, which is set to expire at 10 a.m. local time Friday, was intended to clear the way for talks on a plan put forward by the president last week to end the two-month insurrection in the predominantly Russian-speaking east. Mr. Poroshenko said Wednesday that amendments to the constitution were being drafted on two elements of the proposal, one that would grant greater autonomy to the country's regions and another for a greater portion of tax revenues to remain in local hands.